Every once in awhile, a picture book comes along that is as informative as it is fun. 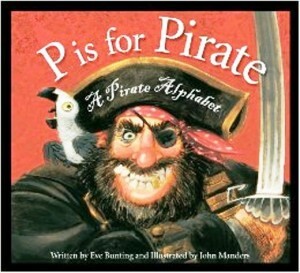 P is for Pirate: A Pirate Alphabet by Eve Bunting is an excellent example of such a book. With this book, the fun actually begins on the cover with an in-your-face illustration of a crooked-toothed pirate and his bug-eyed squawking parrot lodged on his shoulders. No pirate-lover will be able to resist! Inside, young readers are quickly introduced to everything pirate in a clever “grow with the child” format. The younger child can enjoy brief, precise and age-appropriate rhymes that explain pirate terms and/or legends while the older child can digest the detailed sidebars with their lengthy details and explanations. There are pirate bios for Black Bart, Blackbeard, Sir Henry Morgan and Captain Kidd, and a section on the types of weapons they used (a cutlass, a pistol, a knife and a grappling hook). Children learn about pirate codes of conduct, pirate executions, and pirate punishments, like flogging and being forcibly marooned on an island. There is even an illustrated section that displays the various types of pirate ships (who knew there was more than one??? ), like the Merchant, Sloop, Schooner, Brigantine and Frigate. Artist John Manders’ illustrations are dark, dashing and entertaining from the front cover to the back. Children will enjoy sinister pirate smiles, billowing green waters, swash-buckling weapons, and splendid wooden sailing vessels tossed about on the stormy sea. P is for Pirate is a delightful book that is as pirate-naughty as it is informative. However, parents should be aware that very young children may need help with its lengthy passages and vocabulary words. This book is guaranteed to stimulate the minds of young readers in grades 1 through 5, and is perfect for discussions on rules and laws, communities, gangs, strange occupations, and pirating as an American legend and pastime. 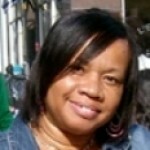 Next articleBelches, Burps and Farts: Oh, My!